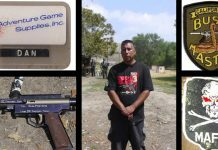 Danny Guardado of the California Bushmaster, Mafia and Airsmith at Adventure Games Supplies tells his story about Northern LA County Paintball History. 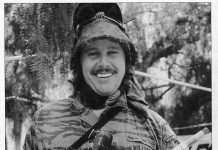 Danny Guardado, pictured at the Bay City Open in 1990. 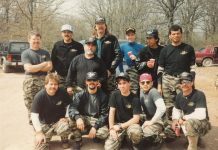 Article scanned from the December 1990 issue of Paintball Sports International. 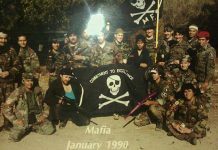 Here is a better quality photo of the Mafia team photograph which Tuty Hernandez, Gilly and Danny shared with me at our Stock Game. Jack Wada’s 59th Birthday Game group shot! 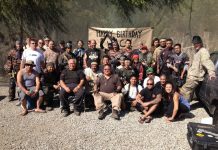 A fantastic group photo of Jack Wada's suprise birthday party at Jungle Island with the Southern California Stock Group. 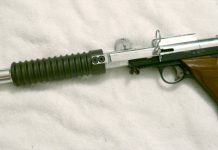 Holding his Frank Postle Frank Gun, and wearing his Who are Those Guys and That Gal Mercenary Servive Tiger Stripe Camouflage. 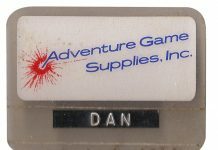 Danny Guardado's Adventure Game Supplies (AGS) name tag from the late 80s/early 90s. 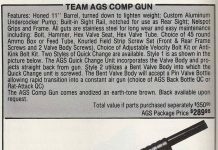 An Adventure Game Supplies ad for the AGS comp gun, scanned from the September 1989 issue of APG. 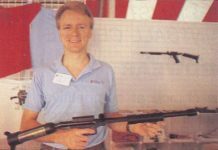 David Craig of Adventure Game Supplies shows off his Landshark pump. 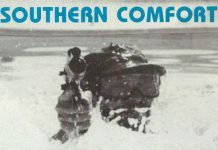 AGS Airsmith, Danny Guardado, remembers back to Taso and AGS and offers some insight. 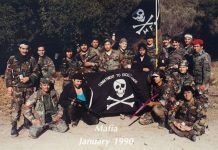 A team photo of the Southern California Mafia sent to me by Gilbert Martinez. 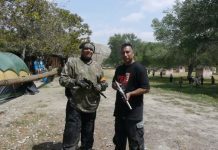 Danny Guardado and Gilbert Martinez identify an unknown pump as the VerbeekOlater and start me on the "Quest" for more information on Tony and Ron Verbeek. 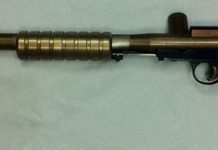 Danny Guardado's Line SI Factory Engraved Bushmaster Deluxe from SPEW 2013. 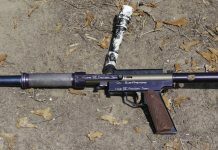 Gilly and Danny talk about the VerbeekOlater nelson based pump that was used by Sudden Death and their time on the California Bushmasters. 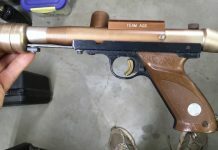 An Earthtone Adventure Game Supplies comp gun I picked up with the help of Woouulf.